I recently got back from a trip to Japan. I was there for a few weeks and visited 8 cities and as you can imagine, I took a lot of photographs. So many photos that I was actually photo-saturated by the end, if you can believe that. I’m starting my Japan coverage today with the cameras I brought. I own a lot of cameras and which set of cameras I bring is always an important consideration. It’s been over 2 1/2 years since my last visit to Japan. Back in the November of 2014, I brought the Fujifilm X100S and the Nikon 35Ti, a high-end point and shoot film camera from the early 90s. In Japan, with the favorable exchange rate, I purchased an entire Pentax Q7 setup, complete with multiple lenses. I ended up shooting with the Q7 the most, really enjoying its small size and interchangeable lenses. This year, I brought my two most often used cameras — the Olympus PEN-F and OM-D E-M5 Mark II. I was tempted to also bring the Pentax Q7 but decided against it, opting instead for the Ricoh GR. The super compact Q7 really works well in Japan, especially for street photographs and I like its contrasty black and whites. But the PEN-F is more versatile, higher quality and with even better black and whites. The Ricoh GR was going to serve as my compact street camera, if necessary. I brought a lot of lenses too. Almost too many, but I used every lens and all the equipment fit into my travel camera bag. I often paired the 9-18mm zoom on the PEN-F with the 14-150mm zoom on E-M5 Mark II. That gave me an effective 18-300mm equivalent zoom range. For lower light, I also brought the 12-40mm f2.8 Pro, my chunkiest lens. For compact street shooting and low light, I brought the 17mm f1.8 and the 25mm f1.4. Finally, for fun, the super compact fisheye body cap lens. All are Olympus lenses except for the 25mm f1.4 Panasonic Leica. I’m still organizing and digesting all the photos I shot, but here’s my final tallies. Duplicates and less than stellar images will be deleted but it’s a time-consuming process. I don’t mind post processing but culling and deciding on the keepers is what I don’t particularly enjoy. I suppose it’s the downside of taking so many photos. I’ll be blogging about Japan for a while. A change of pace from all the recent ROT Rally coverage and other events around Texas. I shot today’s image at the Haneda Airport in Tokyo. Called the Edo-Koji, it sort of simulates the look of old Japan but with modern stores and restaurants. It’s worth a visit and conveniently located in the International Terminal. There are two airports around Tokyo — Haneda and Narita. If you have the choice, fly to Haneda. 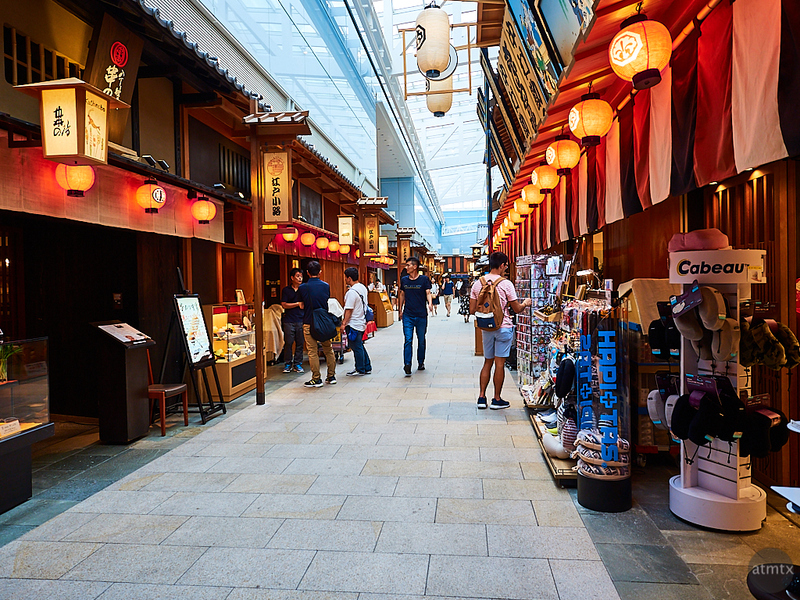 The airport is closer to Tokyo, prettier and you can spend some time at Edo-Koji. Photo saturated? I don’t believe that for a second. 😉 That is an amazing amount of photos but given your time there I almost expected a higher count. I’ve often wondered how you handle such a high volume of photos, especially raw files. How many files do you end up keeping out of over 8000 photos and what do you end up doing with them personally since the number you share publicly is a tiny fraction? Hoping you’ll do a workflow post sometime. My photo-saturated condition does not last long. After several days, I was up for shooting again. I took 6,500 photos in The Netherlands during a shorter trip so, yes, I think I’ve shot more per day in the past. That said, I no longer shoot HDR brackets so the numbers are less inflated. Also, I shot more photos in single shot mode, rather than multiples, so I have less duplicates and more keepers. I guessing that I might get rid of 1/2 the photos. It depends on how picky I get. I don’t think I have a special work flow. I do create a separate library every year. I do use star ratings and color coding for my top picks. However, I no longer spend as much time, as in the past, to cull down my photos. Storage is relatively cheap so I deal with having a slightly inflated library. I tell myself that someday, I may go through all my libraries and organize them further. Perhaps putting the absolute best into something like Apple’s Photos App where AI will auto categorize them and make them available throughout all of my devices. I also separate my personal family photos from my non-family photos into separate folders. I’ve been planning to organize the photos for … I don’t even know how long. I doubt it will ever happen. Heck, I have at least 30,000 per year! The beauty of being a digital packrat is that a full hard drive, physically, looks no more cluttered or doesn’t take any extra space than an empty one. Still all my photos only take up less than 2TB. I have a bunch of drives, but they are basically backups of my main drive. A 4TB drive costs less than $200 so it’s no big deal. I will cull my photos down to a smaller number but I’m not going to spend a lot of extra time to reduce them to the smallest possible set. Back a while ago, I used to spend a lot of time to just keep my ultimate photos and at times I deleted 90%. I’m not going to bother with that, at least for now. Hi Fran, thank you for your suggestion. I’ve heard good things about Photo Mechanic. I’m not sure about adding more software to my toolkit, however, Capture One is slower than Aperture 3 for culling. I’ll keep your suggestions in mind, especially if I get frustrated by Capture One’s speed. I know that’s what Photo Mechanic does well. It makes perfect sense for going through tons of sports shots and narrowing it down. When I go through my urban landscape picks, it’s more subtle than that. Though it would have been useful when I shot all those lacrosse photos. That is an amazing amount of photos! Glad I dont have to edit them. Did you have time to visit, eat and sleep? I had plenty of time for everything. It was a good trip. Even with the large number of photos, I wasn’t shooting tons of photos every day. Our first trip to Arizona, I think 10 years ago, was also the first time I could use a ‘big” chip in the camera — 4GB. I took about 12,000 pictures. It took me more than two years to go through them and in the end, I gave up and simply batches of them. I wish I hadn’t. But storage was a huge issue then. Internal hard drives were smaller and external hard drives were serious money and not nearly as good as they have become. I was overwhelmed. It’s easy to be overwhelmed. Having a new library every year helps, though sometimes I have to open several different libraries to find a particular photo or event. I somehow missed that you got a Nikon 35Ti at some point. Jealous! I’m a bit saddened that you didn’t take the Pentax. Those shots you did with that camera on your last trip to Japan are some of my favorites you’ve ever done. It really seemed to make you think differently and artistically. Maybe the GR was your muse this trip. Yup, I have a Nikon 35Ti and a Contax T2. Both are very similar and basically identical in size. I like the interface on the T2 more but I actually like the picture quality of the Nikon 35Ti more. The Contax is really sharp but has a weird and harsh vignette. The Pentax Q7 is neat but I prefer the black and white of the Olympus PEN-F, plus I get more usable RAWs when necessary. No, the GR is not my muse and I have a love hate relationship with it. But it serves a certain purpose. I suppose if I had the space, I would have also taken the Pentax Q7, but I already brought enough equipment. Thank you, Michael. Yes, perhaps a little luck and lots of curation will get my Japan collection in order. At least I have a lot of content for upcoming blog posts. ← The New Texarkana and Everywhere U.S.A.